What is Hack Access Sligo? 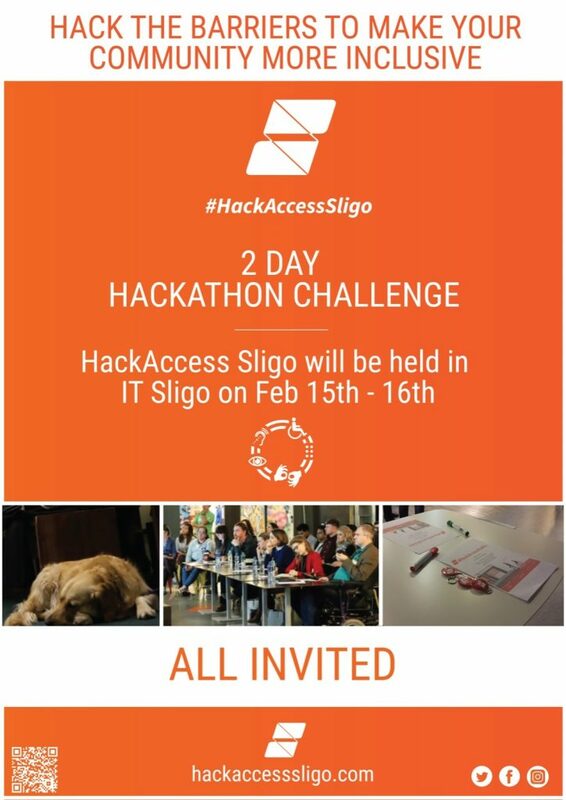 Hack Access Sligo is a competition with a difference, that makes a difference! Competitors are asked to “hack” or solve everyday issues that lead to social exclusion. These issues or barriers are imposed on disabled people by attitudes or environments not designed with their needs in mind, so let’s change that! Barriers to social inclusion can be obvious or subtle. Whether caused by environment, design, technology or attitude the aim is that participants come up with ways to change their world for the better! What do I need to do to enter Hack Access Sligo? All you have to do is go online to hackaccesssligo.com and get your free ticket. You can enter as a team (of up to 5 people) or as an individual (teams will be decided on Friday night). Then turn up at IT Sligo, 5pm on Friday 15th February! Teams will be organised and ideas brainstormed. Saturday will be devoted to “hacking the problem” culminating in judging at the end of the day. Students, graduates, professionals and social warriors are all encouraged to come along! Barriers exist in all shapes and sizes so no matter your skillset, if you would like to have some fun whilst doing some social good, then this is the competition for you! Do I need an idea before I enter Hack Access Sligo? No! Friday evening will be dedicated to giving participants every opportunity to brainstorm ideas. There will be speakers on the night that will give accounts of the social barriers that people experience. Participants are also encouraged to come armed with their own experiences, after all we are aiming to improve access for everyone!